Ten years ago was the year I kept Julia Child next to my bed. Her cookbook, of course, not her. That would be awkward. I would read a few pages of Mastering the Art of French Cooking each morning and another recipe or two every night. 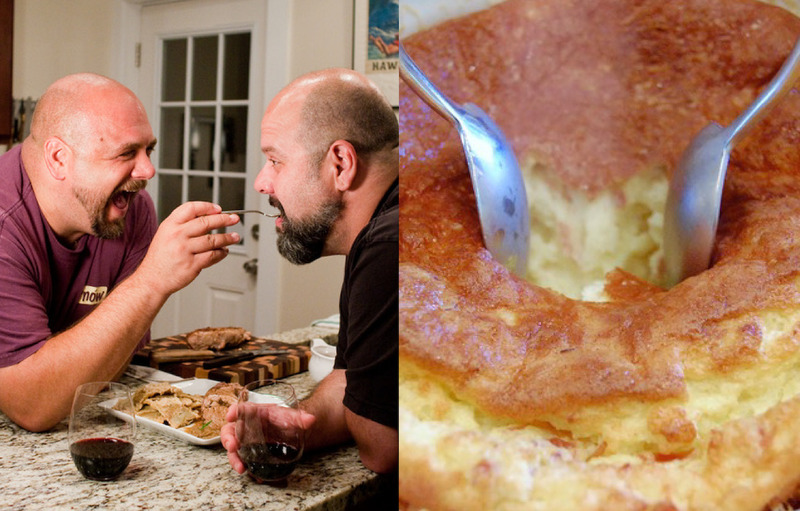 I woke up on Valentine’s Day that year and decided it was time I learned how to make a soufflé. I read the recipe out loud to my husband Jason and Jason jumped in the shower while I headed to the kitchen. Forty-five minutes later, thanks to Julia’s brilliantly simple recipe, I had a beautiful soufflé rising in the oven. I stepped out into the living room and there on the coffee table I saw the pound of Belgian chocolates I had purchased for Jason sitting next to a large vase filled with an arm-load of flowers I had carried home and hand-arranged. Now, Jason and I have no quid pro quo with gifts. There’s no expectation that we spend the same amount of money for each occasion or that we each get the same size stack of gifts. However, as he had not bought me anything yet, Jason was making out pretty well this particular Valentine’s Day and he knew it. Fifteen minutes later Jason came downstairs, looking a bit sheepish, and handed me a folded up sheet of paper. Now, in her recipe for the soufflé, Julia mentions that most French chefs will use a copper bowl, a copper beating bowl, to whisk their egg whites. There is something about the reaction between the egg whites and the copper that delivers a third more volume than egg whites whisked in conventional bowls with that pinch of cream of tartar. So, I open up the sheet up paper Jason handed me and there is a picture of the copper beating bowl he has just ordered for me. This may be the best Valentine’s Day save ever, but Jason is even smarter than he looks. When the copper bowl arrived two weeks later, I had to find out if, in fact, you get a third more volume – you do – and Jason got another soufflé out of the deal. Happy Valentine’s Day. Whether you are celebrating with that special someone, with family and friends, or – most importantly – if you are at a table for one, may you spend the day with someone you love. This is the first soufflé I ever made. Dozens later, it has never failed me. The ingredients are nothing more than pantry staples, making this an easy go-to for entertaining or a quick weeknight supper, served alongside greens dressed in a hand-whisked vinaigrette. Heat oven to 400 F. Adjust the rack so the top of the soufflé dish will be about 8” from the heating element. Butter the inside of a 2 quart soufflé dish. Add grated parmesan and turn dish to coat, reserving extra cheese. Make the Béchamel sauce: Melt 3 tbs butter in a small saucepan over medium-low heat. Add flour and stir together for 2-3 minutes, being careful not to brown the roux. You are cooking the raw flavor out of the flour. When ready, it will smell pleasantly sharp. Remove from heat and add the milk all at once, whisking vigorously to avoid lumps. Return the sauce to medium-low heat and cook for 3-5 minutes until it thickens. The sauce will be very thick. Season to taste with salt, white pepper and a pinch each of cayenne pepper and nutmeg. Stir the egg yolks into the sauce one at a time. Transfer the sauce to a large bowl and stir through the Manchego cheese and jamón Serrano. Whisk the egg whites in a freshly cleaned bowl, or a copper bowl if you have one, until they support their own weight on the whisk. Stir 1/4 of the stiff egg whites into the béchamel sauce. This lightens the mixture so you lose less volume folding in the remaining egg white. Gently fold in the remaining three quarters of the egg white until only a few white streaks remain. Transfer the mixture to the prepared soufflé dish, smooth out the top with an offset spatula (or the rubber one that’s already dirty from folding) and sprinkle the top with the remaining Parmesan cheese. Place in the oven, reduce heat to 375 degrees, and bake for 25 minutes. The soufflé is done when the top is golden brown and moves slightly in the middle when shaken. I prefer mine still wet in the center. Serve immediately. The Holidays 2018: Thanksgiving… you got this!